The St. Clair River begins in Port Huron at the southern end of Lake Huron and flows 44 miles south to meet the freshwater delta of Harsens Island in Lake St. Clair. Together, with the Detroit River, it forms a connecting channel between Lake Huron and Lake Erie which is the international boundary between the United States and Canada. Much of the shoreline on both sides of the St. Clair River is urbanized and industrialized, while the majority of the watershed farther from the river is predominately agriculture. The St. Clair River forms the only major river delta in the entire Great Lakes which is also the largest fresh water delta in North America! Several communities along the St. Clair rely on the river as their primary source of drinking water. The river is a resource for shipping, drinking water supply, commercial and sport fishing, swimming, recreational boating and diving. 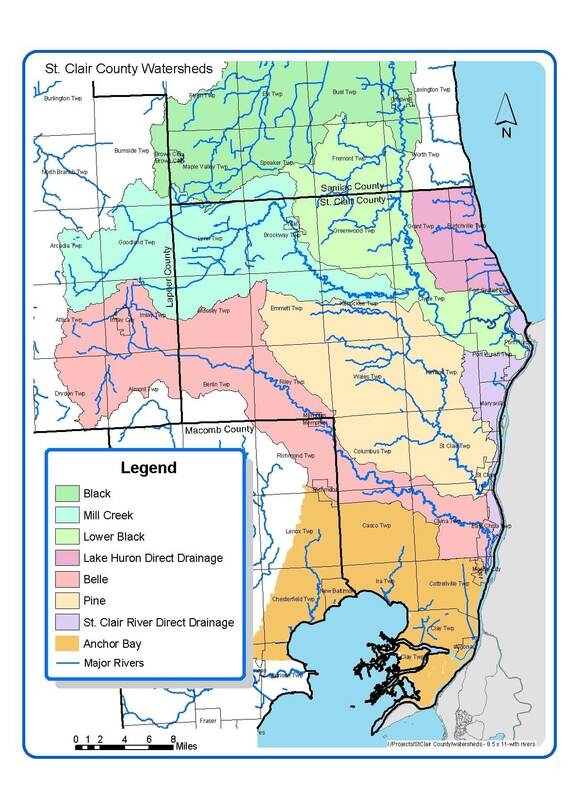 The St. Clair River watershed includes the subwatersheds of the Black River, Bunce Creek, Cuttle Creek, Pine River, Belle River and the Marine City Drain. These subwatersheds span St. Clair County and parts of Lapeer, Macomb and Sanilac counties and drain 780,600 acres or 376 miles of streams that ultimately flow to the St. Clair River. For more information about local watershed planning efforts please visit the St. Clair County Storm Water Program. A watershed is another word for basin. It’s an area of land shaped like a bowl that drains runoff and smaller streams to a larger body of water, like a river or lake. 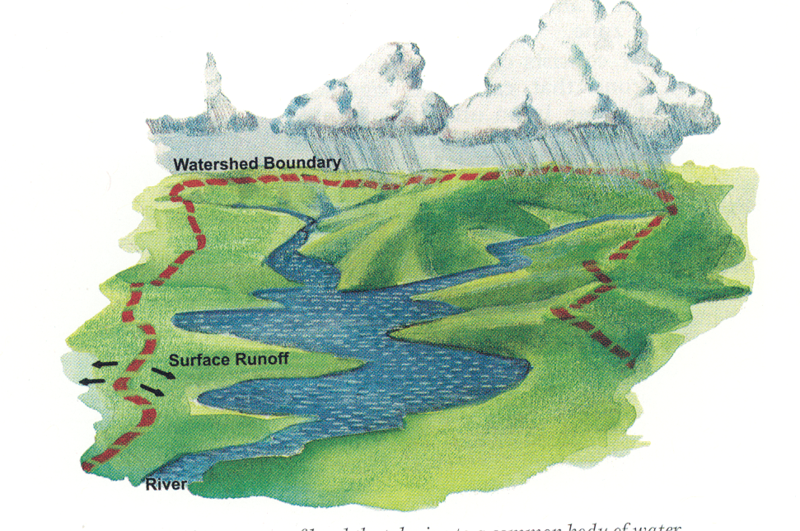 All the water that falls or flows within a watershed drains to the lowest point. If you live in St. Clair County, you live in the St. Clair River watershed. It’s important to remember that what we do on land every day affects the St. Clair River. We all live in a watershed! Many people think that most water pollution comes from industries that dump chemicals into the water, but that’s not true. Did you know that the greatest threat to clean water today is storm water runoff? When it rains water rushes off impervious surfaces like roads, parking lots and driveways. In St. Clair County, our heavy clay soils and tiled farm fields also act like concrete shedding water at rapid rates. All this runoff is called storm water. Storm water picks up many sources of pollutants in its path like litter, pesticides, pet waste, metals, and fertilizers. These pollutants are conveyed through our county drain, road ditch and municipal storm drain systems to end up directly in our rivers. This untreated polluted storm water is harmful for activities like fishing, boating, swimming, and drinking.